News and information for Volunteers. 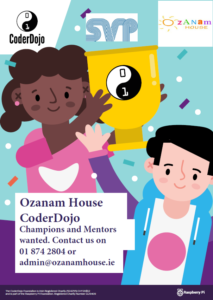 Ozanam House is now recruiting volunteers for its Grinds Club to help with English and Maths, for Leaving Cert and Junior Cert levels. Our expectation is that volunteers commit to one group on one day – 1.5 hours each week. The volunteer should commit to a minimum period of nine months – September to End of May. If the volunteer knows in advance that he or she can only commit to a shorter period of time, the volunteer should let the coordinator know.